Most soil types, but best in moisture retentive soil with rich compost dug in. Sun to partial afternoon shade. Drench plants with a mix-with-water plant food once a month. Cilantro, Marigold, Coreopsis, Zinnia, Corn, Cucumber and Poached Egg Plant. Start seeds indoors in early spring. Set plant out at proper spacing while soil is still cool. 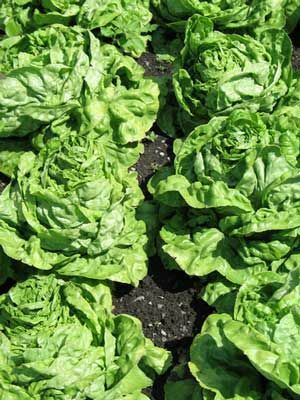 Harvest head lettuce before the plants begin to elongate, because they lose their delicate flavor as they prepare to produce flowers and seeds. Pull up entire plants and use a sharp knife to lop off the roots. Always harvest in the morning, when the leaves are cool and full of moisture. Use a cloth shade cover if needed to keep plants cool during periods of hot weather.